Robert (Bob)A. Williams, age 83 of 5444 Williamson Way, Fort Myers passed away on July 21, 2018 after a struggle with dementia. Bob was born in Olyphant, PA on August 30, 1934 the only child of George and Florence Williams. The family moved to New Jersey where Bob graduated from Montclair High School in 1953. Following high school, Bob served two years in the U.S. Army. Soon upon completion of his military service, Bob married Marion Duncan in 1957, who preceded him in death in 2011. 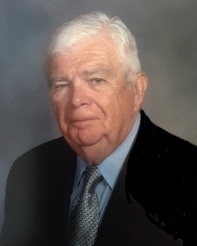 For nearly forty years, Bob worked as an Industrial Sales Manager for Westinghouse Corporation and later Eaton Corporation, which led to moves to New York, NY, Brussels, Belgium and Pittsburgh, PA.
A loyal Boston Red Sox fan, Bob enjoyed golf, travel and reading. Bob is survived by his partner Joyce Lally, his son, Scott and his wife Michelle; son, David and his wife Shannon; and daughter, Traci Moninger and her husband Mark. Three grandchildren, Spencer, Trevor and Hannah. Following his memorial, Bob will be cremated.